Spirent Communications has announced the launch of its new automation and reporting tool, TestDrive-GNSS for SimGEN- and SimREPLAYplus-controlled GNSS test systems. TestDrive-GNSS automates the testing process to significantly reduce overhead costs and testing times associated with characterization of GNSS devices. Spirent’s new software provides a suite of test cases that enables fundamental characterization tests to be performed in an automated and controlled way. 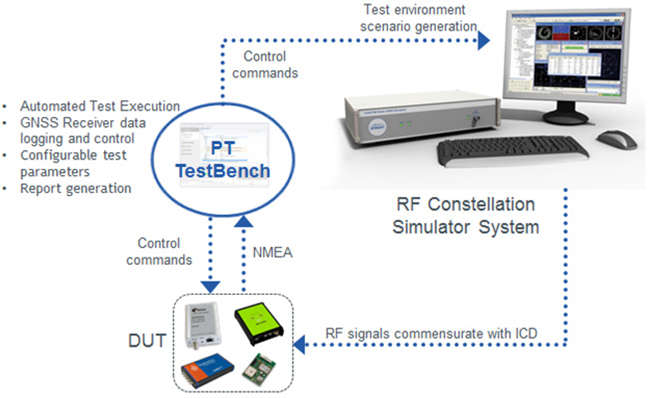 Examples of such tests include time-to-first-fix (TTFF), acquisition sensitivity, tracking sensitivity, re-acquisition time, and static and dynamic navigation accuracy. The tool also provides a formal test report at the end of the process. Characterization tests can be cumbersome to execute manually, especially when iterative repetition is required as test signals and conditions are changed. For example, a TTFF test typically involves 100 or more repeat measurements that, if undertaken manually, require significant operator involvement. Similarly, a navigation accuracy test under a full range of dilution of precision (DOP) conditions requires that the satellite constellation geometry needs to be changed many times. Automation of such a test is essential in a world where the timescales for completing test programs are being constantly reduced, Spirent says. “TestDrive-GNSS not only saves time, but helps to increase test quality and accountability with its comprehensive test reporting. With TestDrive- GNSS, fundamental GNSS receiver characterization has just become a much easier, more efficient process,” said Stuart Smith, product manager for Spirent’s navigation & positioning division. TestDrive-GNSS has close synergy with Spirent’s TestDrive-ULTS software for the 8100 Location Technology Solution (LTS), which tests GSM, UMTS, and LTE mobile devices and chipsets. The new tools also provides certified test cases to the 3G Partnership Project (3GPP) Assisted GPS (A-GPS) RF Minimum Performance and Signaling Conformance standards as well as to the Open Mobile Alliance Secure User Plane (SUPL) standards, according to the company. Spirent will be demonstration TestDrive-GNSS at the company’s exhibit booth (#32) at the European Navigation Conference 2011 now underway in London, through Thursday, December 1.